Habitat: Oat is native to the temperate regions of the Northern Hemisphere. 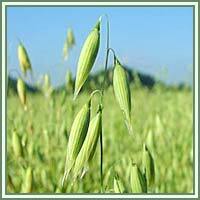 Description: Oat is an erect, annual, herbaceous plant. It has a straw-like stem and very elongated, flat rough leaves. Seeds are gold, elongated and spindle-shaped. It is grown mainly for its grain, which is being used primarily in the food industry. Useful components: Calcium, potassium, silicon, iron, manganese, zinc, vitamins B1, B2 and D, triterpene saponins (avenacin and avenacoside), scopoletin and simple indole alkaloid. Medicinal use: Traditionally, oat was used as nerve tonic-in cases of nervous exhaustion, depression, insomnia. Now, Oat has many medicinal uses. Herbal tea made from the Oat stalks is beneficial remedy in treatment of osteoporosis and high blood pressure. Due to its calming and sedating effect, Oat has been very helpful in cases of depression, nervous exhaustion and menopausal symptoms. It can be used to help calm hyperactive children, fight anxiety and panic attacks. It is said that green oat can help lower the craving for cigarettes. Wild Oat is used as a natural aphrodisiac, increasing the excitability of muscles. 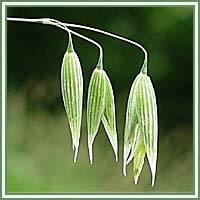 Used externally, Oat can be useful in treatment of eczema, acne and dry skin. Safety: Persons suffering from gluten sensitivity should use the oat moderately. Some herbs could react with certain medication. Therefore it is advisable to contact your doctor/herbalist before consumption of any herb.